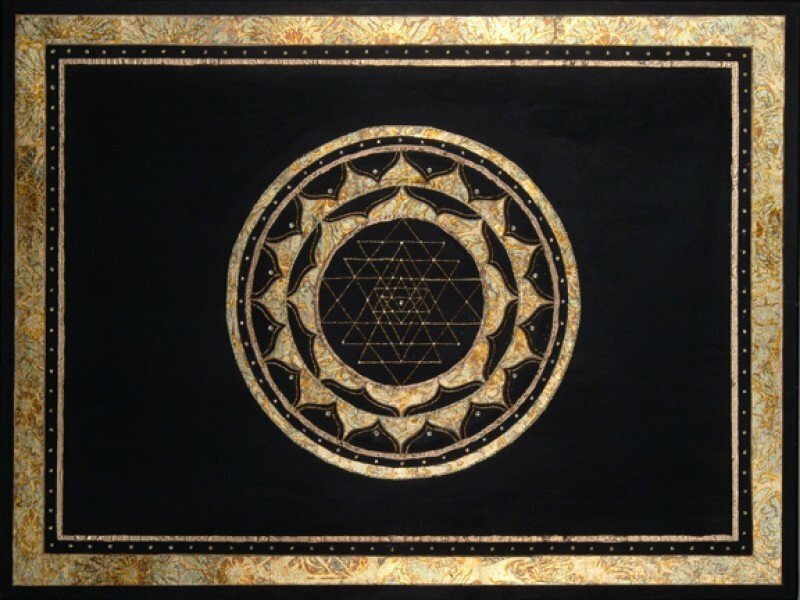 Ebony Sri Yantra | Artwork – Store – Tammi B. Ph.D.
Hand painted mandala, 30" x 40", acrylic, mixed medium, gold leafing and Swarovski crystals. Created from a meditation where I wanted to understand the beginning of creation. A bright light emerged from the void and the deep sound of OM vibrated within. It reminded of the passage: "In the beginning was the Word." From there I saw the Sri Yanta emerge with gold, light and bling! The Sri Yantra dates back at least several thousand years and used as a pictorial representation of the Divine and a powerful image for meditation. The Sri is considered the “Mother of all Yantras.” It depicts the creative forces of the universe in their polarity of masculine and feminine with the upward facing triangles representing Shiva or male energy and the downward facing triangles representing Shakti or female energy. The center point is the origin of creation called the Bindu or the absolute, while the outer region represents the material world. I can recreated this image in any size and and with any color if you like.